Cardboard and rice are ordinary materials which can be found all around us. ATSUKOBAROUH arts drinks talk are introducing 2 emerging artists whose works are made of such mundane materials turned into something completely different. Takayo Kiyota (aka Tama-chan) creates maki-sushi (sushi roll) inspired by her feelings or places around her. Eros, poop or famous paintings are turned into rice rolls in her hands. But they are all eatable. Some may get a little confused to eat an art piece, some would eat it without giving it a second thought. Making, Looking, and Eating - her art elicits participation from audiences. Rolled sushi that challenges us by posing question - Shall we eat the art or not eat? Genta Honnoh began to create his sculptures made of cardboards because it doesn't cost much money to make them. After Great East Japan Earthquake, he realized that his works should also confront society and politics, and he made the work "World Incompetent Summit". 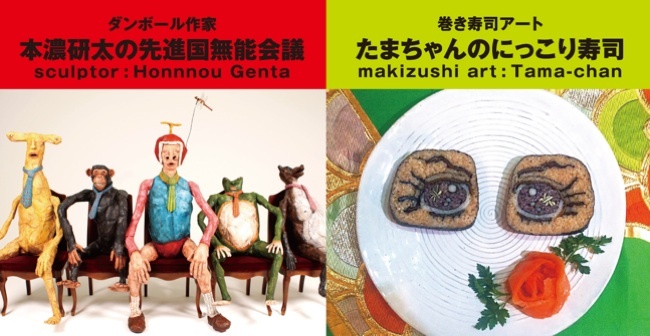 His works are exhibited for the first time in Tokyo; they were previously shown in Tohoku in 2012.